Price: From $250pp. A private Mornington Peninsula wine tour that includes a fascinating narrative about the many sculpture collections in the region that have secured the Peninsula's reputation as the outdoor art capital of Australia. This is not your typical gallery experience as this tour breathes fresh air into a living art studio fuelled by nature, wine, and people. 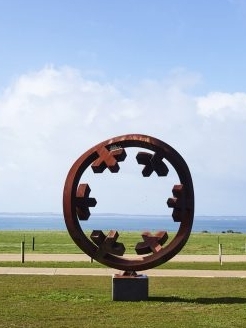 The Mornington Peninsula has become an outdoor sculpture Mecca since Baillieu Myer AC and Dame Elizabeth Murdoch AC DBE laid down an ambitious plan to create Australia’s premier Sculpture Park. Their vision surrounds us on a visit to McClelland Sculpture Park and Gallery in Langwarrin where we enjoy a glass of local sparkling wine before venturing south to enjoy a tasting and tour of Point Leo Estate. Here we wander amongst the outstanding sculpture collection by iconic artists from around the world. The sea is the backdrop at Montalto Vineyard and Olive Grove in Merricks where we tour the wines and the grounds with sculptures. We then head into the hills to Prancing Horse Estate in Red Hill South before visiting wineries and finishing with an intimate tour of The Studio in Hastings to watch artists at work. Our day ends tasting award winning wines at Willow Creek Vineyard, Balnarring North located alongside the extraordinary Jackalope Hotel. We tour in a luxurious Mercedes Benz, enjoying a morning feast with sparkling wine, exclusive access to all wineries and galleries with the exception of Pt Leo Estate where a $10 per person fee applies.